Eddie Aucoin, who has pitched in Europe in Sweden, Germany and the Netherlands, has written a book. 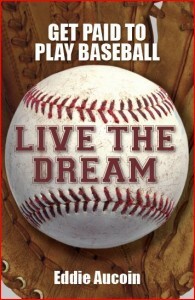 “Live the Dream: Get Paid to Play Baseball” is available now through Playprobaseball.com and Amazon.com for $22,95. Players, parents, coaches (or anyone who knows a baseball player who hopes to go pro) the book you’ve been waiting for is finally here! This is the information EVERY former player wishes he had when the door was still open to play at the next level. This exciting new resource will not only teach you exactly what you must do (from adolescence into adulthood) to maximize your chances of getting drafted and signed by a major league organization, you’ll also learn how to take advantage of a slew of little-known opportunities (both at home AND abroad) to get paid to play ball. This informative and entertaining resource will teach you EVERYTHING you need to know to make the dream a reality and play baseball for a living! So here’s the question: Would you invest less than $25 to give yourself or someone in your life the best possible chance at achieving the dream of playing professional baseball? Here’s just a sample of what you will discover: How major league baseball’s scouting system works, EXACTLY what scouts are looking for (both physically and mentally) at each position, and what you can do to gain maximum exposure to scouts so you don’t fly under pro baseball’s radar How the First Year Player Draft works, how major league teams prepare for it, and subsequently, how you should too How baseball showcases and placement services work, and how to avoid flushing money down the toilet on an inferior one How you can benefit from the host of opportunities that exist to play professionally OUTSIDE the realm of Major League Baseball, including the professional independent leagues and the underground world of international baseball How to market yourself to baseball decision-makers; both inside the major league system and to teams and leagues throughout the world that are looking to sign new players EVERY YEAR How to find professional open tryouts, how they work, and exactly what you need to do to impress pro scouts and decision-makers in a tryout format The ins and outs of professional baseball contracts and which parts you should understand before signing Baseball agents; what they’re all about and what you need to know to protect yourself and your career What life is like as a professional baseball player and what you can expect when you get to experience this unique and exciting lifestyle And a whole lot more…The opportunity is there. Learn how to seize it! Also check out Playprobaseball.com to find more information on the book.